Knox Gorge receives little publicity and fewer visitors but it is one of the hidden gems of Karijini. I was originally intending on doing the walk down into the gorge but we were just too tired to get there early enough in the afternoon to take it on. It’s also apparently quite an arduous climb down and along the gorge. Instead my daughter and I decided to just go see the view from Knox Lookout around sunset. Knox Lookout is a spectacular lookout just a short trip north up Joffre Road. It’s a short 300m/5min walk on a Class 2 trail from the car. Take the steps down to the lookout and watch the views spread out in the distance. This view is especially good in the early morning or late afternoon light. There is a more difficult walk into Knox Gorge – a 2km, 3hour return walk where you climb down and trek along the gorge which we decided to forgo. We’d arrived around 5PM (sunset was in 30 minutes at 5:40PM). 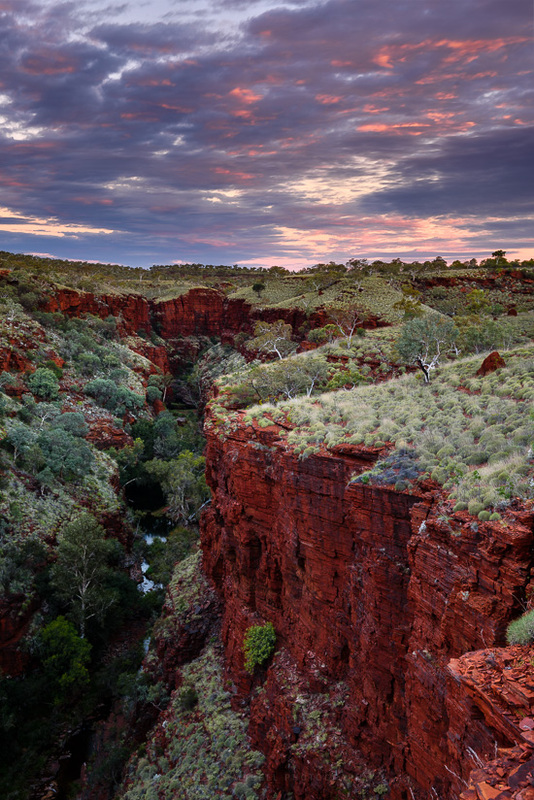 There’s a metal lookout platform that hangs out over the gorge walls which provides an excellent view into the gorges. It does however present the problem of movement and vibrations when trying to take photographs with a tripod. My solution was to set everything up and remotely trigger my camera using my wireless remote after I’d walked off the platform. An easy enough thing to do since we were the only ones here but a minor inconvenience walking back and forth to the camera. When we arrived the clouds were out (which was extremely unusual for our trip) and we were starting to get a little colour in the sky. The lookout is on a corner/bend of the gorge so the deep valleys of the gorge sort of head out in two directions from the lookout. 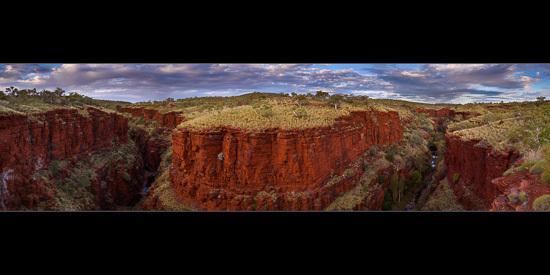 I decided first to compose a wide stitched panorama of the view – sort of my local Australian take on that famous Horseshoe bend. The stitched panorama above is composed of nine (9) vertical frames taken at 38mm (with the camera leaning as far forward over the railing as I could get it with the tripod). I also tried another at a wider 24mm which does let you see further down into the gorge but given the location and the high guard rail there was no way to take the shots without a significant portion of the rail curving through the frame. The sun was setting behind us so I’ve rotated about 90 degrees to the right and am shooting along the gorge on the right with the sun having set to my right. This frame at about the height of the colour at 5:48PM (around ten minutes after sunset). This image is an exposure blend of three brackets frames -1&2/3EV, -2/3EV and +1/3EV. Something I didn’t know before coming to this gorge is you can make it to the Handrail pool and down the handrail and just under half way around the pool at the bottom by skirting around the sides without having to fully swim. However that is normally as far as the general public would go. You can however swim across the last of the Handrail pool to a cut and a further gorge on the other side of the pool from the handrail. This gorge extends another 100m further on and in some parts you HAVE to swim (you can’t even wade – it’s deeper than I was tall and the sides are cliffs of slick rock). 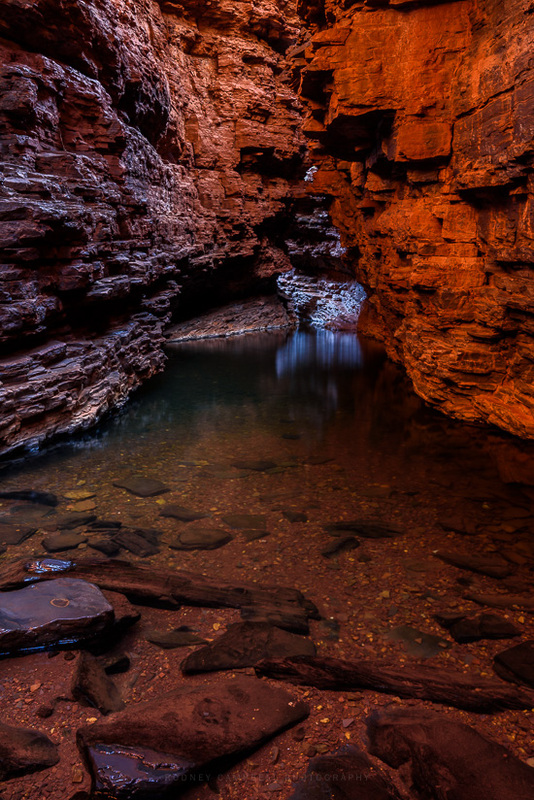 After going through a bit of an underground tunnel you come to a spot where there is a dropoff where you cannot go any further (without ropes, guides, etc) however you can shoot down the dropoff to the pools below and the gorge extending beyond. 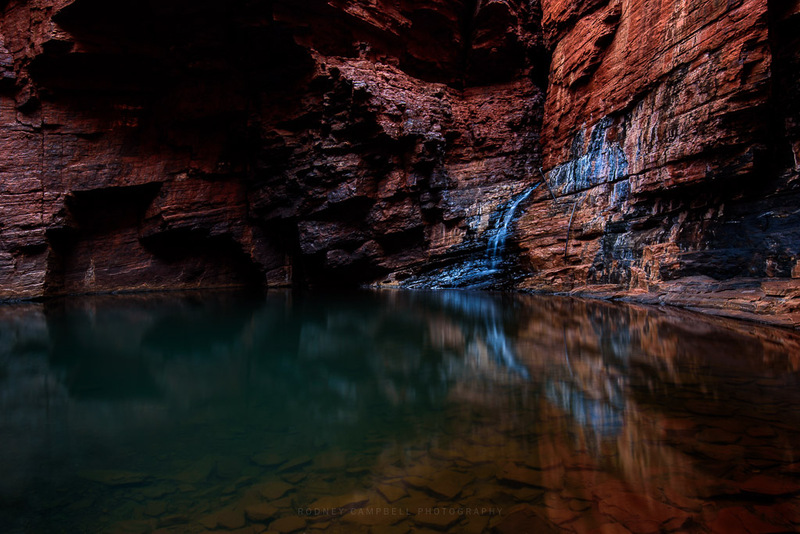 This is yet another spectacular vantage point with water cascading over a dramatic series of cascades. If you want to take your camera here you must have a dry bag. You push it in front of you with your gear inside as you swim along. 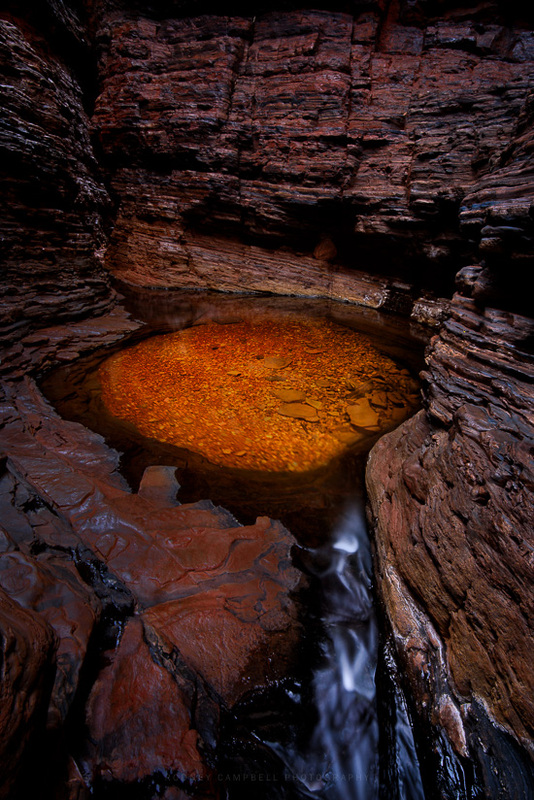 If you plan to swim you may want to factor in that the water is freezing – I mean take your breath away cold. Before heading there I was considering buying some sort of light wetsuit/sharkskin thing to wear for this single bit. In the end I didn’t and I figured I’d risk it and just take a towel and something warm to wear afterwards (a thermal top). I’m glad I did because I was shivering to death by the time I got back to the Handrail pool :). It was now nearly 10AM and still no-one else has ventured down here. My daughter and I have had the place all to ourselves since we first started down here at 7:30AM. It was now time for us to leave and head back to camp for a well earned meal and rest :). Actually before we drove back to camp I took my daughter to see the view from Oxer and Junction Pool Lookouts. 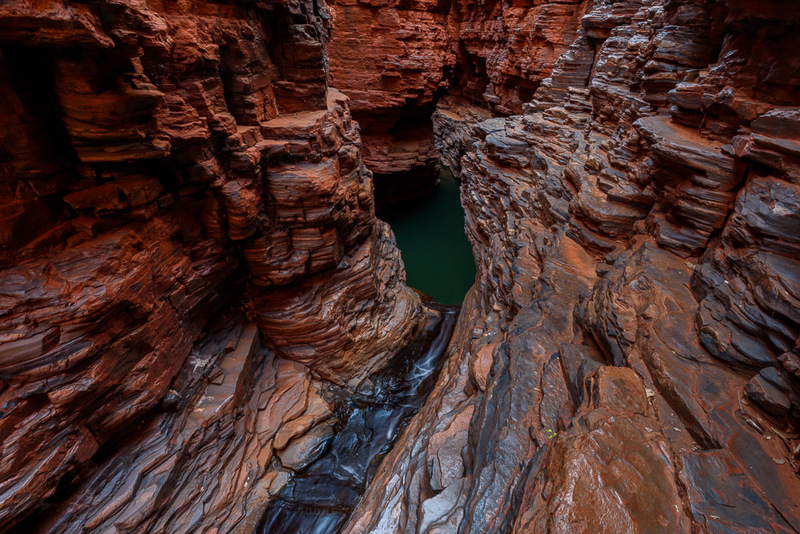 This would be our last chance – we were leaving Karijini tomorrow to head towards the coast in the direction of Exmouth. 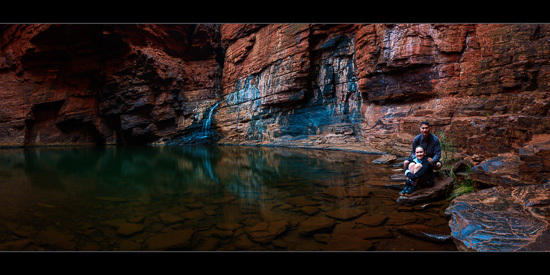 Finally we made our way to the famous Handrail Pool at the bottom of Weano Gorge. 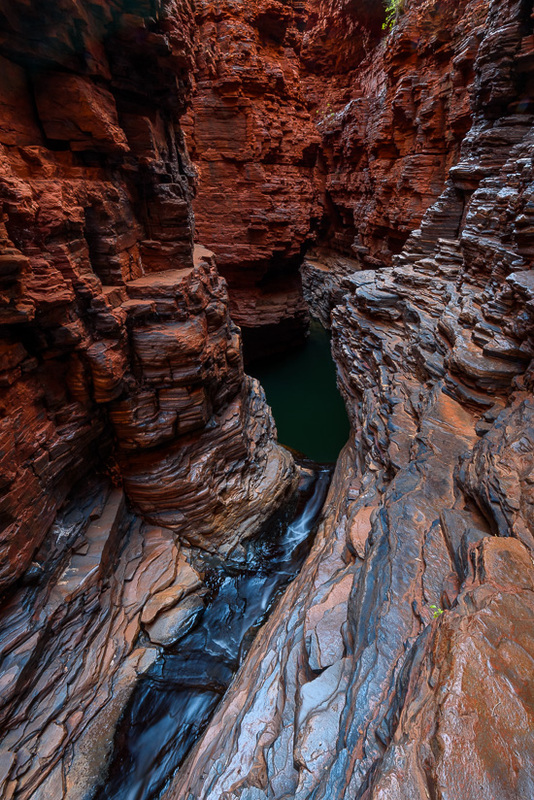 The gorge narrows to the width of one person before opening into a cathedral like cavern and to the emerald waters of Handrail Pool. The pool gets it name from the curved tubular handrail which runs down the gorge wall from the gorge opening down to the pool roughly 5 metres below (you can see it on the right side in these images). To get inside the cavern where the Handrail pool resides you have to use the handrail to climb down from where the gorge emerges above the pool. It’s a relatively easy descent with steps carved into (or bolted onto) the rock. At the bottom you can work your way just under halfway around the side of the pool at the bottom. 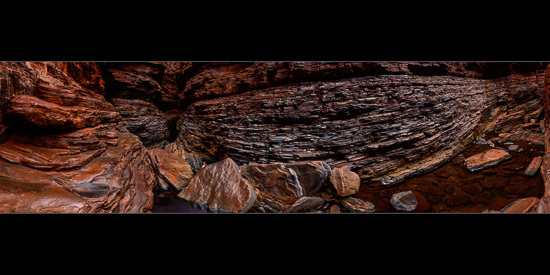 I took a very wide stitched panorama whilst we were on the dry area at the side of the Handrail Pool at the bottom. I took twelve (12) frames at 32mm for a very wide aspect which covered most of the view from this spot (approx 270 degrees I’d say). I then took a couple of extra takes of the second last frame on the right with just my daughter and with both of us to include in any stitched result. I took the extra frames at ISO 800 and 1 sec rather than the longer exposure so I could control our movement a little better. I preferred this tighter cropped version of the right half of the full pano with the two of us in it but you can see the full wide pano by clicking on the image. When I’m out taking photographs (and often even when I’m not) I’ve always got my eye on the lookout for something different, something I can craft into something hopefully special. 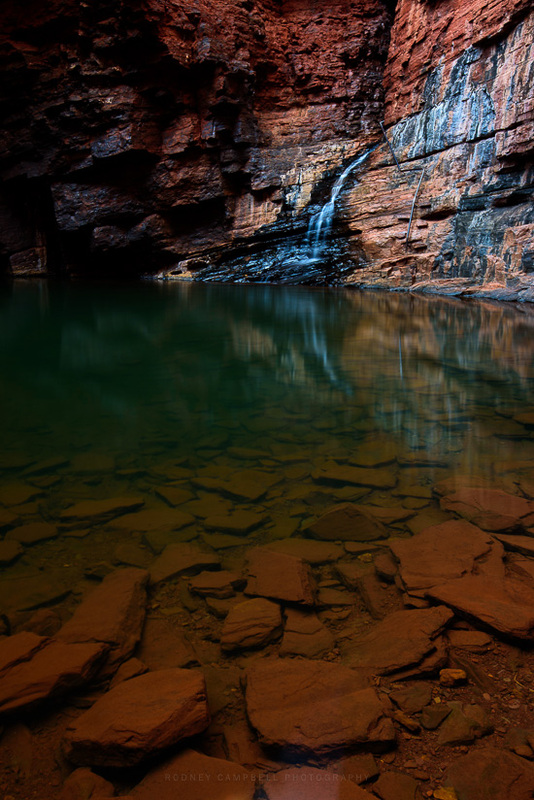 As it was this day when my daughter and I were heading down Weano gorge towards the famous Handrail pool. I had of course read up on the pool and the location and had seen many images taken at the pool (we’ll get to that in due course :)). This little spot with this fabulous little circular pool which is perhaps 5 feet across is literally just ten metres or so before you get to the dropoff and the handrail which leads down into Handrail pool. I knew I could do something with this pool so getting my daughter to back up behind me, I set to work. I shot this little pool from both sides (here we are on the “top” side – that little gap on the other side is a very narrow windy section you have to go through before reaching the Handrail pool). I also shot vertical and horizontal compositions but this (my first composition setup here) ended up being my favourite when looking to process. So here we have my little take on this little eye looking up at the world from below. I could almost have titled this the Midnight Apostles :). The Twelve Apostles is a collection of limestone stacks off the shore of the Port Campbell National Park, by the Great Ocean Road. Their proximity to one another has made the site a major tourist attraction. Currently there are eight apostles left, the ninth of the stacks collapsed dramatically in July 2005. 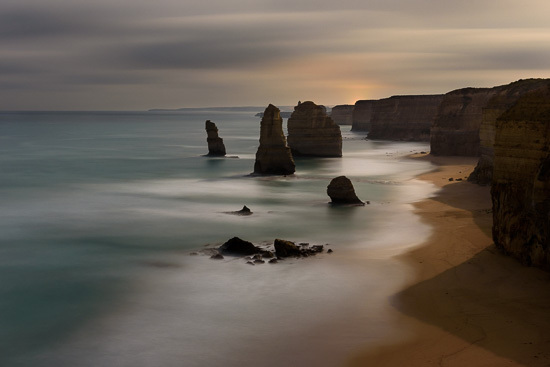 The Twelve Apostles name however remains significant, known as such world wide, and the view is still spectacular. The apostles were formed by erosion, the harsh and extreme weather conditions from the southern ocean gradually eroded the soft limestone to form caves in the cliffs, which then became arches, which in turn collapsed; leaving rock stacks up to 50 metres high. A little after 9:30PM I finished up my session down on the sand at the bottom of Gibson Steps. In the darkness I left and made my way back up to the car. Once I’d packed up and changed my wet socks and shoes it was almost 10PM. I still wanted to take a look at the Apostles from the viewing platform. After all I was just a few minutes away, and this place is over a thousand kilometres from home so it’s not like I can come here easily. So here I present a not often seen interpretation of the classic Twelve Apostles view. It is taken from the same viewing platform that everyone takes their shots from. However I was here alone in the dark at 10:10PM – a thirty second test shot at ISO 6400 had shown me what was going to be possible. My take is a natural five and a half minute long exposure lit solely by the light of the rising two thirds moon (over to the right out of frame). Then it was time to pack up, leave these amazing Apostles and head back to the car for the long drive home. Unfortunately I hadn’t factored in the abundant wildlife out on the roads at night so it was going to be a slow trip back to Port Fairy. I didn’t get to bed till around 1AM.